You love your baby and want the best for them and have probably taken them on several doctor’s visits already to make sure that they are healthy. But even if your pediatrician checked your baby’s hearing, there could still be warning signs of a developing problem. Now is the time to catch any hearing issues, and here are some signs to look out for. From as soon as right after birth, a baby should show signs of responding to sounds. A newborn will be startled by sudden noises and as they get a few months older will be able to turn their head towards sounds they can’t see. You’ll know that your baby might have hearing issues if they are falling behind on milestones in their language development. For example, most babies will start vocalizing at two months old, and move on to babbling and imitating sounds after six months. 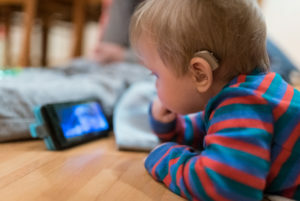 By their first birthday, if they haven’t said their first word or have started saying “ma-ma” and “da-da” it could be a sign that they are missing out on language development because of hearing problems. It’s never too early or too late to take your baby to an audiologist. Many hearing problems can be detected early, and for those that develop later it is good to establish a relationship with an audiologist who will be able to spot any issues in your child as they get older. Taking your baby to an audiologist is important for answering any questions that your pediatrician may not be able to answer as thoroughly. Protect your child’s hearing by investing in some sound-blocking headphones that are specifically designed for infants. Use these headphones any time you plan on taking your baby to a noisy environment, such as a public event. The headphones will protect their hearing and also reduce their anxiety if the baby is not used to crowds where they could be overwhelmed. Think about how your baby’s ears are more delicate and sensitive than yours so be aware not to have the TV too loud or the volume too high on your car radio. As adults, we naturally begin to lose our hearing as we age so we might have the volume higher than we realize. Contact Bay Area Audiology Today for Your Hearing Care! This entry was posted on Monday, March 18th, 2019 at 9:54 am. Both comments and pings are currently closed.